ryo | I heard you liked music in anime and video games! 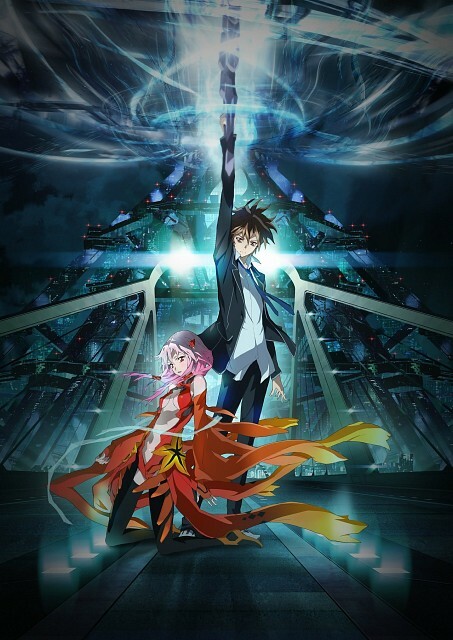 Guilty Crown is an anime television series created by Production I.G and first aired in 2011. The story takes place in the year 2039 and is about a young boy by the name of Shu Ouma who obtains “The Power of the Kings” which allows him to draw out another person’s “heart” and use it as a weapon called a “void.” If a void is destroyed, the person who the void had originated from is destroyed as well. Eventually Shu gets caught up with a resistance group known as “Funeral Parlor” which wishes break Japan away from the international organization GHQ. 10 years prior to the story on Christmas Eve of 2029, the “Apocalypse Virus” spreads throughout Japan, but the international organization GHQ conducts martial law and restores order. Ten years later, 17 year old Shu Ouma comes into contact with Inora, the singer of the band Egoist, and accidentally obtains “The Power of the Kings” and gets involved with Funeral Parlor. The anime progresses to show the story of Shu’s involvement with Funeral Parlor and his lost past. The music in Guilty Crown was composed by Hiroyuki Sawano. The anime’s opening and ending themes were written by Supercell, an 11-member Japanese Pop music group. The opening theme of the anime is “My Dearest” and is sung by Koeda. The ending theme “Departures ~あなたにおくるアイの歌~” is performed by the anime’s fictional band known as Egoist. Chelly, who was picked by Ryo of Supercell, provided the vocals. Guilty Crown’s music really adds to the emotional impact of the anime. The opening scene of the anime’s first episode (see the above video) is a powerful one. The insert song, Euterpe which is sung by the character Inori who’s part of the anime’s fictional band Egoist, plays as Shu watches the music video for the song featuring Inori (lead singer of Egoist) unaware of Inori carrying the void genome in her hands and running for her life. The music helps parallel and contrast the opening events of the first episode that are occurring: Shu appears calm and bored as he watches/listens to the music video of Inori singing while Inori is busy running for her life. The music in the anime helps to add to the emotional tension that occurs throughout the anime along with the feeling of momentous triumphs.